De La Soul's debut album 3 Feet High and Rising is a hip-hop landmark; but it has never been available to stream or download. For years, it has been shunted between record labels, none of whom could sort out the complex licensing issues around the record's numerous samples. That was set to change on Friday, with the album primed to debut on Spotify, marking its 30th anniversary. But it was pulled at the 11th hour, as the band said the deal was unfair. On Instagram, the group alleged that record label Tommy Boy would get 90% of the profits from 3 Feet High (and several other classic De La albums that were primed for release) while they would see roughly 10%. The deal is particularly complicated because of what the band describe as a "phantom $2m debt"; which Tommy Boy boss Tom Silverman claims he is owed. "The actual offer was 30% to De La," David 'Trugoy' Jolicoeur told Rolling Stone. "But with this phantom debt that's in the air - this $2m dollar debt - what he proposes is, 'Since you guys are getting 30, I'm going to take 20 of that 30 and kick it back to your debt'." Upon learning of this deal, Jay-Z refused to put De La Soul's music on his Tidal streaming service; while A Tribe Called Quest star Q-Tip called for a boycott of Tommy Boy. Noticing the bad publicity, the label decided to "postpone" its release of De La Soul's back catalogue until the dispute was resolved. "Because Tommy Boy has not had the opportunity to sit down together with De La Soul and finalise our negotiations - something we've wanted to do for months - we have decided to postpone the digital release of their catalogue scheduled for tomorrow," said the label in a statement on Thursday night. In an email to Rolling Stone magazine, Silverman characterised the dispute as a "misunderstanding". "While we are confident that this can be resolved, we were saddened this is happening around the 30th Anniversary of their debut album 3 Feet High and Rising, and to see factually incorrect statements attributed to members of the group," he said (he did not clarify which of the group's statements he found to be inaccurate). 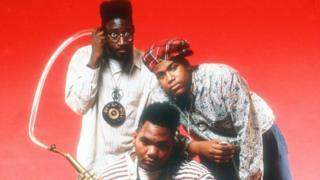 Speaking to the BBC in 2016, De La Soul's Kelvin Mercer, aka Posdnuos, described the unavailability of their back catalogue as "heart-wrenching". He explained that the band's samples - more than 70 on 3 Feet High and Rising alone - had (mostly) been cleared for release in 1989; but their contracts failed to predict the rise of digital music. "Our contracts on those early albums said specifically 'vinyl and cassette,'" he said. "The wording wasn't vague enough to lend itself to [new] music technology. "So once the whole age of digital music came into play, new deals needed to be cut for those entire albums. Their record label at the time, Warner Bros, "just don't want to deal with it", he added. "They're like, 'Is it worth it?' They've got to go through almost every song with a fine comb to make sure this sample or that sample was cleared. "It's been a very lengthy, draining process."